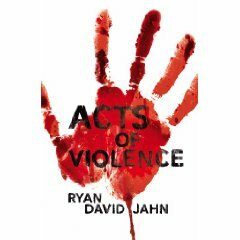 Acts of Violence is set in a ‘cesspool of a city’ somewhere in America in 1964. Kat Marino has just finished her shift as the night manager of a sports bar. In a clipped, cinematic style Ryan Jahn leads us through every harrowing detail of the next two hours of Kat’s life. It starts at four o’clock in the morning. Kat has locked up and walked alone into a dark parking lot. The tension builds as she is forced to linger and change a flat tyre. During her drive home, she listens to the radio. A newsreader talks of President Johnson and Jimmy Hoffa and the voice of Buddy Holly sings ‘Not Fade Away’ from ‘beyond the grave’. The novel is filled with dark imagery and visions of death; radios are ‘killed’; engines ‘die’. People stare at their own reflections in darkened windows as though looking at ‘ghosts’. This is not just the story of Kat however; it is also about the neighbours who do nothing to save her. First there is Patrick, a boy who has just received his ‘Orders to Report’ for military service. From a modern perspective, the reader is chilled to discover that he is nineteen, the age, according to popular folklore, at which most soldiers died in Vietnam. His terminally ill mother presents him with a moral dilemma; she wants him to help her commit suicide. Next door, Thomas Marlowe is holding a gun to his head because he cannot come to terms with his homosexuality and believes there is ‘simply no reason to keep waking up.’ Downstairs two couples are engaged in a ‘swapping’ session which ends in tears, misunderstanding and violence. All of the neighbours witness some part of Kat’s brutal murder from their respective vantage points at windows overlooking the courtyard. They all understand that the police should be called. And they all assume that someone else has already done so. A black man in a racist society, Frank Riva is the nearest (apart from Kat) that this book has to a hero. His wife is white. Her father’s casual rejection of Frank as a suitor, twenty years previously, and their subsequent elopement, is described through Frank’s memories. The most dreadful irony of this story is that by following his conscience and his desire to help his wife, Frank is drawn away from home during the critical two hours when he might have saved Kat. The most terrifying character in the novel is police officer Alan Kees. A deluded and self-pitying psychopath, he bends the law and uses his power ruthlessly. ‘You’re either the teeth or the throat they sink into, and there ain’t no inbetween,’ he says. Absurdly, he sees himself as a ‘good police officer’. Another deluded character is Nathan Vacanti, the sixty-five year old schoolteacher who has spent his career sexually abusing children. David, the ambulance paramedic who is called to the scene of Mr Vacanti’s road-traffic accident, is one of his former victims. Like Patrick, David is faced with a moral dilemma. Nathan pleads with David to spare him. He says he knows he’s made some ‘mistakes’ but believes that ‘he’s done more good than harm’. Like Nathan and Alan, William, the serial killer is deluded and incapable of taking responsibility for his actions. He is sorry for his victims but believes it’s not his fault; ‘someone should stop me’ he says. He refers to his crimes as having ‘happened’ as though by accident. He even seems to hold a quasi-religious belief that perhaps he’s supposed to be doing these things ‘for a reason beyond his understanding’. The author builds up tension skilfully and the reader is hooked from page one. This is an excellent, thought provoking novel and I recommend it.